Lead generation is challenging but not if you have a successful strategy in place. Voice Broadcast is considered as one of the best ways for lead generation as well as to improve customer relationships and experiences. Voice broadcasting is the technique of delivering pre-recorded messages to customers automatically. Appointment reminders, delivery delay notices and policy changes are some of the crucial information types that customers welcome receiving through voice broadcasts. Unlike an email or text message, voice broadcast involves a recorded human voice and hence exudes a greater level of warmth. It is cost effective and time-saving too, because you can send voice message to 1000s of people within a few seconds without actually speaking directly to them. How about that? Despite these compelling benefits, some companies complain of a low success rate in their voice broadcast campaigns. Why is this? Do you suffer from the same quandary? Well, according to experts, most small and medium-sized businesses do not build voice broadcast campaigns correctly, professionally and within the guidelines of federal do-not-call regulations. And it’s a consequence of this fact that in the name of voice broadcast, they follow a unscrupulous strategy where they make their telemarketing teams do intrusive calls, pushing products and services, not required by the recipients. Analyze your business operations. Consider what type of business you have and what kind of goals you wish to accomplish from the voice broadcast campaign. Design the campaign in accordance to the goals you have set. Decide the budget and the broadcasting tool you are going to use. Tip: If you have converged cloud based CRM solutions to manage your business, you are sorted. They offer multichannel marketing feature, using which you can communicate with your potential and current customers through voice broadcast medium. All you need to do is create the voice message or IVR, upload a spreadsheet with the targeted phone numbers, and the CRM will do the rest. Once you have set the goals for the campaign, decide what is your target audience. Remember, your aim should be to use the campaign for connecting with people who have high possibility of being interested in your products and services. Selection of the target audience will enable you to create personalized voice message that strikes the right chord in your recipients. Create a personalized voice message for not more than 30 seconds. Introduce your brand at the start to establish the credibility of your message. Give clear information about your products and services in the next line i.e. before the listener loses his interest and hangs up. Ensure that the voice message is not a bland sales pitch but interactive. It should generate customers’ interest so that they start asking questions regarding your deals. You can also include some attractive offers in the message to capture interest and compel your leads to get hooked on. To foster engagement, instruct your recipients to take an action after the completion of the message. For example: Press 1 to get a free demo or Press 2 to directly talk to the sales executive. This approach will motivate people to act and contribute in your lead generation numbers. Recipients who accept your proposition can get more detailed information about your products and services in the next step of action. This is a great way to keep your recipients engaged and generate more and more number of leads. Note: Getting a response is the key to successful lead generation. So keep the call to action simple to understand. Make it as easy as possible for your target audience to act. Ensure that the voice you use is crystal clear, strong, friendly and easy to the ear. The tone should not be “salesy” but positive, inviting and polite. Simultaneously, the recording should have good sound quality without long pauses. Tip: Hire an experienced voice talent agency to record your message. This will ensure that the message is powerfully said and well received. Give your recipients the opportunity to opt-out i.e. unsubscribe from future calls. This will prevent you from wasting time and resource on sending messages to the people who are least/not interested in your offers. Also, you can focus more on the right prospects and leads for your voice broadcast campaigns. Messages must be delivered in a certain way to make the required impact. And the first rule of thumb for this is the delivery hour. Time your voice broadcast campaign carefully. Avoid making early morning or late night calls as then your message will be nothing more than a nuisance – no matter how well it’s constructed. Aim to deliver your message from 6:30 to 8:30 PM for live answers. You can specifically send the message during mid-day so it hits voice mail or an answering machine where your targeted audience can listen to the message at their convenience and you may win new customers successfully. Gone are the days when voice broadcast campaigns meant unsolicited messages. Today – Spam don’t work. So you need to have a proper road-map while designing your voice broadcast campaign. All the above-mentioned rules on the use of recorded voice messaging need to be followed. 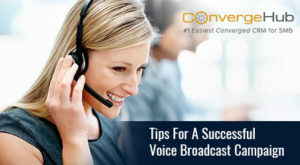 Then only will be you be in an advantageous position to make your voice broadcast campaign stand out from the crowd and gain the expected ROI out of it. What Is A Converged CRM?